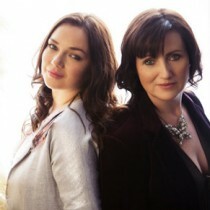 Lumiere’s debut album brought together two distinct voices cut from the same geographic cloth.One is Éilís Kennedy, whose sound has ready access to the soul without need for scaffolding or spotlights.The other half of the musical whole is Pauline Scanlon, an award-winning singer from the same Kerry town of Dingle. With Lumiere, the song and its delivery are the primary focus, technical concerns gives way to feeling as song and singer effortlessly merge. Since their debut launch, the duo have toured their distinctive sound from the cosy snugs of their native Dingle to international concert halls, and a worldwide audience has connected with their offering of real music by real singers communicating real emotions. As a duo, Lumiere takes something that is sacred and age old and re-imagines it simply and beautifully, reclaiming beauty, truth and trust, for the modern age. Their follow-up album, much like their singing, has been honed and re-shaped without losing any of its impact and earthiness. Whereas their debut album ploughed their creative fields, now they are ready to populate those fields with seeds of inviting instrumentation, a more confident and fuller sound, and an artistic harvest that will appeal to the musical tastes of a broader audience.